I hope you had a great weekend so far! Stew the leeks. Then add the broccoli leaves and the peas. Season and cook till all ingredients are soft and golden. Meanwhile beat the eggs together with the parmigiano and add them into the pan. Leave for few minutes and then put in a preheated oven. Cook till gold and ready. The great thing about this dish, is that you can use any combination you have in mind (or in the fridge and i the kitchen cabinets). In future posts I will share with you more ideas for frittata. Have a great Sunday evening! Надявам се, че имате страхотен уикенд! Задушете праза. След това добавете листата от броколи и граха. Овкусете добре и гответе докато всички продукти омекнат. През това време разбийте яйцата заедно с пармезана и ги добавете в тигана. Оставете ги така за няколко минути, а след това преместете в предварително загрята фурна. Гответе до златисто. А най-хубавото на това ястие е, че можете да направите безброй комбинации, които имате наум (или които имате в хладилника и кухненския шкаф). В бъдещи публикации ще ви споделя още идеи за фритати. Желая ви страхотна неделна вечер! Today I would like to share with you one of my favorite fish leftovers dish – a Fish stew. Днес бих искала да споделя с вас едно от любимите ми ястия от остатъци с риба – Рибена яхния. To be in any of the Jamie’s Italian spots was pretty exciting for me. I had an unplanned business trip to Manchester and decided to take an advantage of it. And to be honest, I couldn’t wait to go and visit the place. The entrance of the restaurant was very welcoming and was promising a great dinner. And it didn’t let us down. The building was meant to be a bank for a long time, but recently became one of Jamie’s Italian restaurants. The bank vault was kept and nowadays is a room which could be rented for special events. The enormous space wasn’t exactly how I was imagining Jamie’s Italian though. I was thinking of a more cozy place than a bank. But the food was a great example of Jamie Oliver’s passion for the Italian cuisine and of his whole philosophy for food. The starters we took were Creamy Burrata cheese with cherry tomatoes and basil and Spicy Meatballs with tomato and basil sauce. Both of them a good example of the simple and non-pretentious Italian food. The main dishes we took were Slow cooked lamb in Tuscan style and Swardfish steak with smashed avocado and cherry tomatoes salad. The taste was fantastic. The lamb was so lean that it was melting in the mouth and was seasoned great – as you really are in Tuscany and are able to try a mixture of all its tastes. The fish was light and fresh. The food was combined with craft beers and refreshing Pinot Grigio. Then it was time for dessert – Lemon Cheesecake and Strawberry Semifreddo. So tasty, but so sweet. No matter how much a love sweets, I couldn’t finish my dessert. But the taste of it was the great end of a great dinner. Going to the UK and to one of the Jamie’s Italian restaurants made me read more about the crisis of this chain earlier this year. The Italian restaurants of Jamie were almost let to bankruptcy and Jamie Oliver had to invest a lot of his savings to save it. And I couldn’t stop wondering why… Jamie Oliver for me is a synonym of affordable (both economically and in terms of time) way of cooking. He encourages people to go back to the homemade food and shows them how easy and cozy it is to eat home. May be here is the biggest mismatch of the ideas and the philosophy – eating home or going to one of Jamie’s restaurants? Jamie Oliver is already a very strong brand in the modern culinary industry but in my mind it is always meant for cooking at home and making people spend time and share food together and enjoy the coziness of their own homes. I would go again there, don’t get me wrong. I enjoyed the experience and the food and I would like to try more of what’s Jamie’s choice to include in his menu. But I would definitely prefer to watch his TV shows, to read his books, to try his recipes at home. In this lovely sunny autumn not-a-working Monday (at least in Bulgaria) I thought it is a great idea a Caramelized fruit cake. Put sugar into a big pan and leave it on medium heat till it gets caramelized. Meanwhile cut the fruits into large pieces and arrange them in a baking pot. When the caramel is ready, pour it over the fruits and leave it a part. Then put in a large bowl the eggs and the sugar and beat till white foam. Add the flour and the baking powder and mix gently. Pour the egg mixture over the caramelized fruits and bake in preheated oven for approximately 40 minutes (or till gold). Meanwhile mix well the sour cream, the castor sugar and the vanilla extract. When the cake is ready, you have to turn it over till is hot (before the caramel gets harder). Then let the baked and turned over cake to cool down and pour the cream on top. You could decorate with fresh fruits (I used raspberries). Let the cake to rest for at least 4 hours and enjoy it 🙂 To add more autumn taste, you could use for the caramelized fruits pears or quinces as well. В този прекрасен слънчев есенен и неработен (поне в България) понеделник, реших, че Сладкиш с карамелизирани плодове би бил чудесна идея. Изсипете захарта в голям тиган и оставете на среден огън докато се карамелизира. През това време нарежете плодовете на големи парчета и го подредете в тавичка. Когато карамелът е готов, го изсипете върху плодовете и оставете настрана. Вземете голяма купа и разбийте яйцата и захарта за бяла пяна. Добавете брашното и бакпулвера и разбъркайте внимателно. Изсипете яйчената смес върху карамелизираните плодове и печете в предварително загрята фурна за около 40мин (или до златисто). През това време объркайте добре заквасената сметана, пудрата захар и ванилията. След като сладкишът се изпече, още докато е топъл (преди да е стегнал карамелът), го обърнете наобратно. Оставете го така да изстине добре и след това намажете отгоре със заквасената сметана. Можете да декорирате с пресни плодове (аз използвах малини). Оставете сладкиша “да почине” поне 4 часа и след това му се насладете 🙂 За да добавите още повече есенен вкус, за карамелизираните плодове можете да използвате и круши или дюли. Last weekend was rich of events in my lovely Plovdiv. And the best one was the food festival Mood for Food – food for all senses. The festival took place for the first time ever – from the 14th till the 16th of September in the heart of Plovdiv. There were several restaurants and street food vans presented, as well as a lot of local and regional products. It was great how all the 3 days it was crowded the whole time. I see how the people of Plovdiv are getting more and more being keen on the food they eat and the time they spend with friends and family enjoying that food. It is a matter of life stile, so much part of the whole life of the city. Coming back to the things I tried, I found out that there is an amazing locally made traditional dip called Gurmenitsa. It was simply fantastic with its several tastes – tomatoes, pepper and eggplants or just bell peppers and green eggplant. Then it was a great (both as taste and size 😄) portion of pork ribs – one of the best I have ever tried. All this combined with local drinks – craft beers and wine. The great thing is that the festival was so successful that it will be repeated next year. And I can’t wait for it. Миналият уикенд беше богат на събития в любимия ми Пловдив. И най-доброто от тях беше кулинарният фестивал Mood for Food – храна за всички сетива. Фестивалът се проведе за първи път – от 14ти до 16ти Септември в сърцето на Пловдив. Бяха представени няколко ресторанта и ванове за улична храна, както и местни и регионални продукти. Беше страхотно как и трите дни беше претъпкано с хора през цялото време. Виждам как хората в града се интересуват все повече и повече от храната, която консумират, както и времето, прекарано с приятели и семейство, консумирайки тази храна. Това е въпрос на лайф стайл, толкова дълбоко залегнал в живота на града. Връщайки се обратно към нещата, които опитах на фестивала, няма как да не спомена Гурменица – местен производител на лютеница, кьопуло, домашен айвар, както и специалитетът им от печени зелени чушки и патладжан. След това трябва да спомена страхотните (и като вкус, и като размери 😄) свински ребърца – едни от най-добрите, които някога съм опитвала. Всичко това беше комбинирано с местни напитки – основно крафт бири и вино. Going slowly to the Autumn, it feels more and more important to live that last days of the summer at their best. Either if this means a walk in the forest, a lunch outside, or one of the last summer barbecues. Spending quality time with our closest people is important and doing it with delicious and healthy food makes it even better. Our dinner was made of salad (with tomatoes from the garden), pork steaks, grilled vegetables and sea breams. When you have somebody not eating meat (as me), an idea how to combine meat and fish on the grill is to put the fish in aluminum foil. The way we cooked our sea bream was that we seasoned it with salt, pepper, oregano, garlic, lemon and olive oil. The vegetables we seasoned also with salt, pepper, oregano and olive oil. The result was fantastic. Приближаващата се есен ни напомня да изживеем пълноценно последните летни дни. Дали това ще означава разходка в гората, обяд навън или едно от последните барбекюта за сезона, това зависи само от вас. Да прекарваме стойностно време с близките си е много важно, а да го правим и с хубава и здравословна храна, го прави още по-хубаво. Нашата вечеря се състоеше от салата (с домати от градината), свински котлети, гриловани зеленчуци и ципури. В случай, че имате някой неядящ месо в компанията (като мен), идея как да комбинирате месо и риба на скарата е като увиете рибата в алуминиево фолио. Ние приготвихме нашата ципура като я овкусихме със сол, пипер, риган, чесън, лимон и зехтин. Зеленчуците овкусихме също със сол, пипер, риган и зехтин. Резултатът беше фантастичен. I hope you enjoy as much as you can the summertime. My husband and I are just back from our honeymoon and I can’t wait to share our food experience and inspirations during it. In each city we visited, we notices the biggest chalange was where and what to eat. That’s why I decided to share with you what we liked and enjoyed the most. Secondo – Filetti di trota salmonata alle mandorle con papate saute (Trout salmon fillet with almonds and potatoes saute). This amazing food we had with a glas of white wine from the region – Aldo Rainoldi – Zapel. The food was simply fantastic, the wine as well. After a nice walk around the lake, we needed a rest and what is better in this case than another glas of wine with a view 🙂 We took the funicular to Brunate and found the most amazing views to the Lake – Il Balcone sul Lago cafe. The girls working there were very friendly, the views – stunning and it wasn’t costy at all. A glas of Pinot Grigio was served for only 3,50 EUR. At the end, when you go back with the funicular to Como, you could enjoy Aperitivo (a drink with buffet included) for only 10 EUR (which is in fact even cheaper than in Milan). You could find Aperitivo in most of the cafes, even on the once around the lake. If you follow me for a while you will know how much I love food markets (you could read more here). Today I was in La Boqueria Mercat, Barcelona and I found out it was one of the places I liked the most in the city. The food markets are part of the daily life in Spain and are presented in each city. The food market in Barcelona has first started back in 1217 and the main purpose of it was selling meat. It has moved its position during the centuries, changed its name and finally in 1840 found its current place at La Rambla. Of you are in Barcelona, it is really a must visit. Тези от вас, които ме следват от повече време, вече знаят колко много обичам пазарите (можете да прочетете повече тук). Днес бях на пазар Ла Бокерия в Барселона и трябва да ви кажа, че се превърна в вдно от любимите ми места в града. Пазарите са неизменна част от живота в Испания и можете да ги откриете във всеки град. Пазарът в Барселона действа от далечната 1217 година, като първото му предназначение е било продажбата на месо. След това е местил мястото си, сменял е името си, докато най-накрая през 1840г е намерил настоящето си местоположение на улица Ла Рамбла. Ако имате път към Барселона, заслужава си да го посетите. I guess many of you have been to Greece, but for us it is a very special place. With my husband we spent our very first anniversary as a couple there (long time ago), then we lived in Greece for almost an year, we go there almost every summer for our holiday there, and finally we went there right after our wedding (two weeks ago) for couple of days. For us Greece is peace, holiday mood, almost a home and one of the best cuisines ever… But Greece for us is also friendly environment full of emotions and close relationships between the people, it is invitation for a barbecue in a back yard, it is an easygoing mood, a way of living. 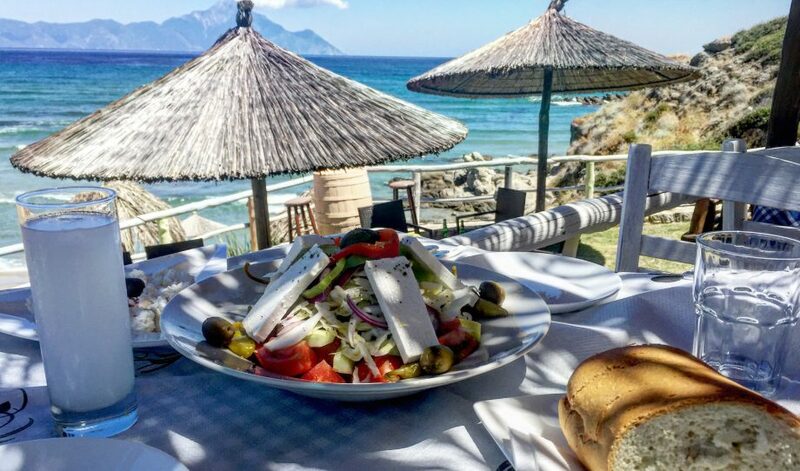 If you have a favorite place in Greece, I will be happy to hear about it! Предполагам много от вас са били в Гърция, но искам да ви разкажа защо тя е едно много специално място за нашето семейство. Със съпруга ми отпразнувахме първата си годишнина като двойка там (преди много много време), след това поживяхме в Гърция близо година, почти всяка година година прекарваме лятната си ваканция там, отидохме там за няколко дни и веднага след сватбата ни (преди две седмици). За нас Гърция е спокойствие, почивка, почти дом и една от най-вкусните кухни на света. Но Гърция е също пълна с емоции, темпераментни хора, много близки взаимоотношения между хората, покана за барбекю в задния двор, безгрижно настроение, просто начин на живот. Ако имате любимо място в Гърция, много ще се радвам да чуя за него!